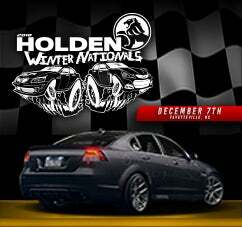 Fayetteville, NC (November 9, 2018) – The Holden Winter Nationals will be held at the Crown Expo on Friday, December 7. This event will have it all, from test & tune, to grudge racing and even an indoor car show with vendors! Let’s be honest, it’s not just about going fast. You have to look good doing it! The car show will allow you to win in more than just the 1/4 mile!